In the heart of Old San Juan is a Spanish Colonial architectural delight, Hotel El Convento. With six elegant salons, which can hold everything from intimate dinners to elaborate receptions, your guests will experience flawless service and celebrate with you an event that brings something ‘old’ and something ‘new’ for your wedding day. Inaugurated in 1651, the Carmelite Convent was created to withstand Indians, European enemies, hurricanes and tropical heat. Doors and grilles were made of mahogany and iron wood which seems to increase it’s strength as it ages. For 252 years this building housed nuns and then it was abandoned. In 1959 Frederic Woolworth (yes heir to the Woolworths fortune) purchased the convent from the Archdiocese for $250,000 and transformed it into its present deluxe hotel. There are now 100 rooms including 10 suites. A lot of the original artwork, wrought-iron fixtures and decorative tiles remain today. The first two floors are now designed and feature restaurants and cafes, meeting and banquet rooms. This is the only small luxury and four diamond hotel in the heart of old San Juan. So why get married here? One of the most monumental buildings is the Cathedral of San Juan Bautista, located across the street from Hotel El Convento, whose Spanish architecture invites you without having to be a believer. The stained glass windows, statues and especially its high ceilings, domes covering it possible not only transported to the era of conquests but to other parts of Europe. Many celebrities have chosen the Cathedral for their wedding and then walk across the street back to the hotel for their reception. Each year, more than 2 million weddings are performed in the U.S. and, of the 82% of couples who honeymoon, their top destination choice is consistently the Caribbean. Ranked by Brides as one of the top honeymoon destination in the Caribbean, the U.S. Virgin Islands has teamed up with Sur La Table, the hardware store for cooks and bridal registry destination, and Blue Nile – leading online retailer of diamonds and fine jewelry – to offer one lucky couple the chance to win a “Perfect Island Escape” for two to St. Croix. 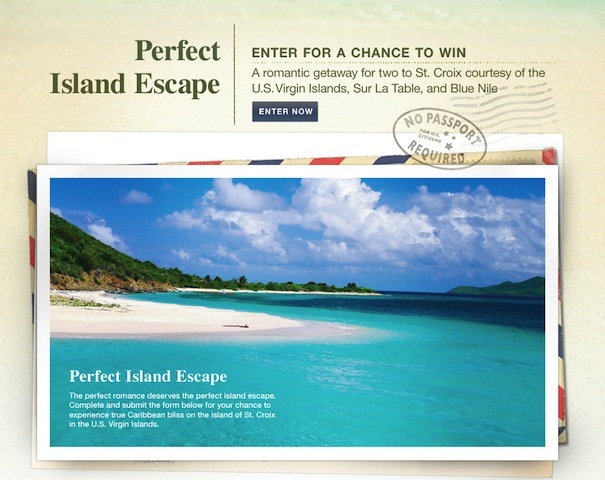 To enter, go to www.perfectislandescape.com and complete the entry form (Sorry – limit one entry per person). If you don’t end up being the lucky winner but want to plan your own romantic escape to St. Croix, you can explore The Buccaneer’s Romance add-on package. If they’re yet to be engaged, the resort’s “Pop the Question” package (complete with engagement ring) may be a good fit. Brides and grooms who love to cook you’ll love Sur La Table’s bridal registry can visit http://www.surlatable.com/registry/giftRegistryHome.jsp. I’ve just returned from a magical trip to Puerto Rico and visited some of the best hotel properties the island has to offer. Of course, one of my favorite properties is El Conquistador Resort. Let me tell you this is one of the closest ‘all-inclusive’ type properties there is on the island of Puerto Rico. While there (and there is so much more I have to share with you) I found out about a great 12/12/12 offer they have for couples, and I couldn’t wait to share it with you. In celebration of this year’s triple digit repeating date – the last until the year 2101 – Hilton Worldwide properties in Puerto Rico are offering special options for couples planning12/12/12 nuptials. Dream destination weddings are now more affordable than ever on the tropical Island of Enchantment – where no passport is required for travel by U.S. Citizens – with 12/12/12 wedding specials available. El Conquistador Resort, A Waldorf Astoria Resort is celebrating 12/12/12 with an over-the-top “Love in the Sun” package, available to wedding parties booking 12 or more rooms, and including exciting options for brides- and grooms- to-be. With a savings of $2,012, the package includes an officiate, one hour of photography, one hour of live music and the choice of several incredible ceremony venues, including the 100-acre, private Palomino Island. The package also includes 12 Coqui Water Park passes (one per room), 12 welcome drink vouchers (one per room), 12 deluxe ocean view upgrades, 12 fitness center passes to the renowned Golden Door Spa (one per room) and complimentary champagne and chocolate-covered strawberries for the new Mr. and Mrs. This exclusive package is $5,000 and is valid for weddings celebrated the week of December 9-12, 2012. Package rate does not include accommodation. El Conquistador Resort’s nightly rates start at $199 per room per night based on double occupancy. After the wedding is over, couples can leave wedding guests behind and immediately begin their honeymoon with an escape to the cliff-side Las Casitas Village, A Waldorf Astoria Resort – El Conquistador Resort’s award-winning neighbor. With sweeping ocean views, full kitchen facilities, 24-hour butler service, private dining options and a breathtaking infinity pool, Las Casitas Village is ideal for couples seeking an unforgettable 12/12/12 honeymoon retreat. I promise you, you will absolutely love the wedding staff, the food, their private island…off the property (the boat ride is not only romantic, but once you get on the island, it’s like…your own) or be a kid at the water park. 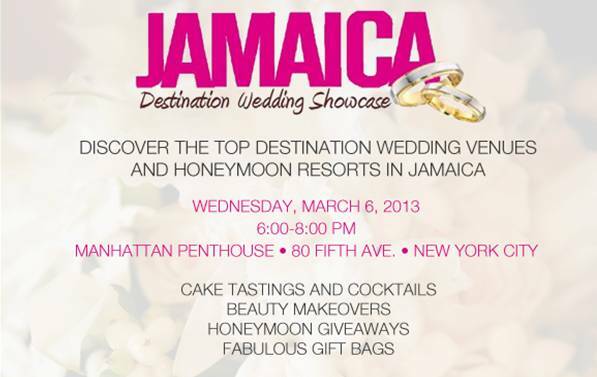 This is one property I promise will make all your wedding dreams come true. For more information, call 1-888-564-1307 or visit www.elconresort.com, www.lascasitasvillage.com.